Freeman & Harding Ltd offer 10% discount to current members of the BBKA. In order for your discount to be applied to your account, you will need to first create an account on our website. Click here to create your account. Once this is done, send us a message using the "contact us" button on the website (^ up there in the green bar ^) quoting your BBKA membership number and expiry date. PLEASE WAIT for an acknowlegement of your request. Sometimes, emails get lost in cyber space. A good way to check that your BBKA discount has been applied is to see if the prices are different when you log out. Your discount needs to be applied BEFORE you place any orders on the website. Unfortunately, discount cannot be applied retrospectively to orders placed before your request is processed. We will not only give you a 10% discount across our entire range of jars* but you will also have access to our very special prices exclusively for customers collecting at the National Honey Show, Beetradex or BBKA Spring Convention. Our most popular jars will be offered at Special Show Prices. Of course, any of the other items on our website may be purchased for collection at the show. Special Show prices will only be displayed for 4-6 weeks before the show date so don't worry if you can't see them at other times of the year. The Honey Show category can be found here. If you've signed up to our newsletter we will email you to remind you about our special offers. We always sell out so be sure to reserve your stock in advance. You will only see the discounts and special offers when you are logged into your Freeman and Harding account. * Items already discounted are not included in the 10% BBKA offer. We sell honey jars direct from our stand at the British Beekeepers Association Spring Convention, Beetradex and also the National Honey Show. 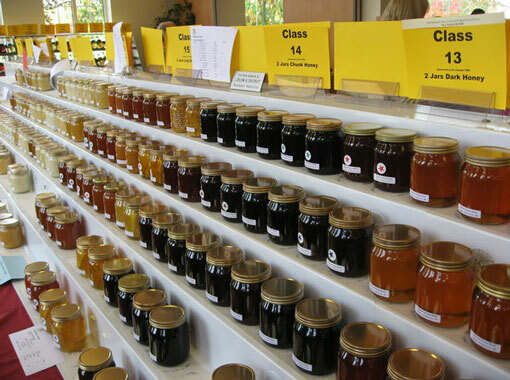 We have special honey jar offers for the show and advance ordering for collection at the show is recommended to guarantee your stock will be available. If you would like us to keep you informed about future special offers on honey jars for the BBKA Spring Convention, Beetradex or The National Honey Show please complete the form below. Exclusive to Freeman & Harding Ltd, the half pound screw neck traditional honey jar. It helps to preserve the cleanliness of the jars as received by Freeman & Harding from the glass manufacturer. However, it must be stressed that it is NOT a guarantee of sterility. It assists the distribution of the matching number of the jars and caps removing the necessity to count out the requisite number of caps with each carton of jars. There are surprisingly few instances of glass breakages but should this occur the fact that the other jars in the carton have lids fitted prevents glass spicules contaminating the inside of the remaining jars in the carton. It also prevents the ingress of insects or other parasites during storage before filling. The batch traceability of the glass jar is preserved. Each carton label has a unique code from which it is possible to identify the glass manufacturer’s glass batch and the identity of the packer. In addition, our cardboard cartons can be re-used for storage and distribution of filled jars. The pack is available with either gold lacquered tinplate caps or white plastic wadless polypropylene caps. It is twenty five years since Freeman & Harding introduced this pack and its continued and growing popularity is testimony to its success. Insist on the best for your honey and buy the “SPECIAL BEEKEEPER PACK”. Click the "send me information on our special offers please" and you will receive an email with our latest offers for any upcoming exhibitions.